Downy yellowjacket (Vespula flavopilosa) is an uncommon, medium-sized, predatory, social wasp. It is found in the northeastern United States from Minnesota to Maine, south to Virginia, and along the Appalachian mountains to northern Georgia. It closely resembles eastern yellowjacket. It is thought by some to be a hybrid between eastern and common yellowjackets. Others suggest that it probably arose as a hybrid but now queens mate with drones of the same species. The overwintering queen emerges from hibernation in April or May. She builds a nest of 20 to 45 cells and cares for the grubs as they hatch. In about 30 days the workers emerge and take over nest building duties. 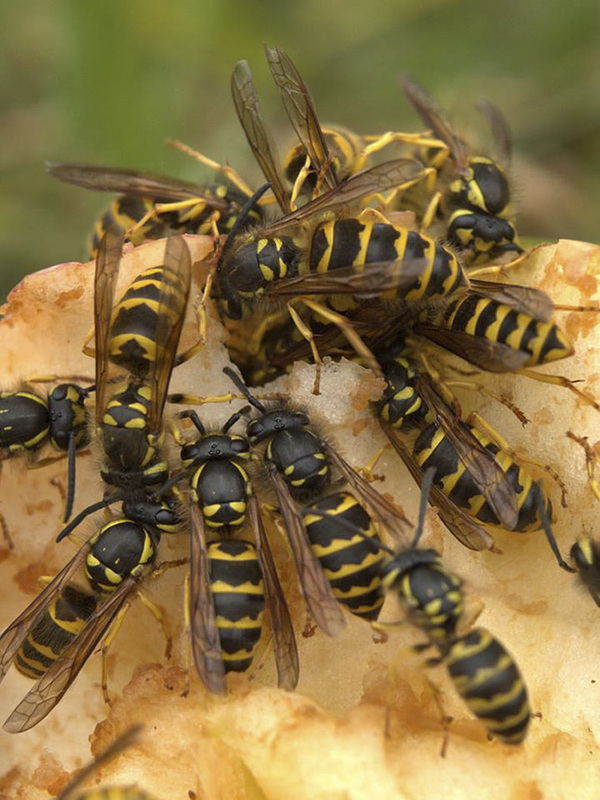 Through spring and summer the queen produces a large number of worker wasps. In mid-summer, the nest grows exponentially, as more and more workers become available, ultimately with 3,500 to 15,000 cells. Only the new queens survive the winter, hibernating under loose tree bark, in a decaying stump, or in another sheltered location. In eastern North America, four yellowjacket species, common, downy, eastern, and German yellowjackets, closely resemble each other, making identification difficult. Downy yellowjacket is distinguished from the others by a continuous, uninterrupted yellow band on the face below the compound eye; and by the shape and pattern of black markings on the first and second abdominal segments. This entry was posted in Insects and tagged downy yellowjacket, Vespula flavopilosa on September 6, 2017 by John Valo.